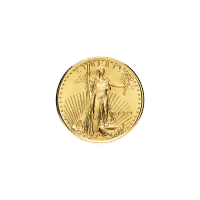 Buy 1/10 oz American Eagle Gold Coins | ?? 1/10盎司随机年美国鹰金币 The American Gold Eagle Coin was authourized by the Gold Bullion Coin Act of 1985 and was first released in 1986. It is offered in 1/10, 1/4, 1/2 and 1 troy ounce increments and each coin is guaranteed by the U.S. government to contain the stated weight in pure gold. The Eagle coin is 22 carat gold and is made from 91.67% gold and 8.33% copper to make it more durable. This combination is traditionally referred to as "crown gold" and was used by the British Crown for centuries to make coins last longer, while still containing the requisite amount of gold. The total weight of this coin is 0.1197 troy ounces and this allows the coin to still have 1/10 oz of gold, even though it is not 999 or 9999 pure gold. The obverse of the coin features a full-length rendition of the Augustus Saint-Gaudens Lady Liberty with flowing hair, an olive branch in her left hand and a torch in her right hand. The Capitol building is in the background. Lady Liberty is encircled by a rising sun and 50 stars. The word "LIBERTY" and the year of minting are also printed on the face of the coin. The reverse of the coin was designed by Miley Busiek and features a flying male eagle, also with an olive branch, and a female eagle and her hatchlings in her nest. The words "UNITED STATES OF AMERICA" are featured prominently and the phrases "E pluribus unum" and "In God we trust" are on either side and the bottom contains the weight, purity and face value, in this case "1/10 oz Fine Gold - 5 Dollars". This coin has become a staple in the bullion world and is practically synonymous with reliability, having become one of the most recognized gold bullion coins in the world. These coins are discounted as they may be tarnished, scratched or visibly handled. Year and condition are subject to availability. Note that from 1986 until 1991 the US Mint used Roman numerals for the year as well as for a couple special edition versions. In 1992 they began to use normal digits for the year. Individually, this coin ships in a coin capsule.